In this talk, I will present state-of-the-art numerical efforts to capture the physics of galaxy formation and evolution in the explicit framework of the standard cosmological model, consisting of an expanding Universe accelerated by a cosmological constant and with a mass content dominated by collisionless cold dark matter. More specifically, I will discuss cosmological hydrodynamics simulations of two sorts. In the first part of the presentation I will review large volume simulations which allow one to perform a statistical comparison with observations but only reach a resolution comparable to the size of galaxies (see e.g. www.horizon-simulation.org). In a second part, I will focus on "zoom" simulations of individual galaxies performed at a resolution which resolves the giant molecular clouds where clusters of stars are born. 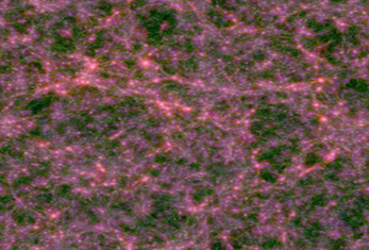 I will highlight how such simulations permit a better modelling of the physics of star formation and stellar feedback and discuss the impact this has on the integrated properties of galaxies. Julien Devriendt did his PhD thesis on the theory of galaxy formation and evolution at the Institut d’Astrophysique de Paris and then was a Leverhulme Post-Doctoral Fellow and Wolfson Junior Research Fellow at the University of Oxford, and a visiting Astronomer at the Centre de Recherche Astrophysique de Lyon. He is currently on leave from CNRS and Physics Lecturer at the University of Oxford.